If any substantial amount of weight is being used, it is recommended that there is a stand nearby to place the dumbbells on when finished. Grip the dumbbells (wrist straps may be needed if the weight cannot be held for complete sets), lift the weights off the stand, let the arms hang at the sides, and ensure that the core is kept tight throughout movement, which, in turn, maintains the back in a straight position. This is optimal. 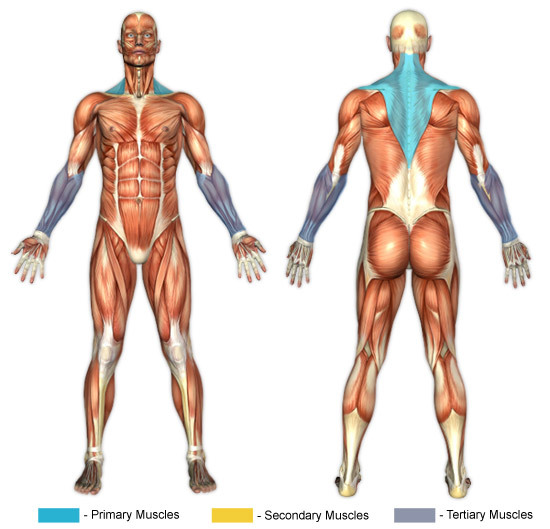 Dumbbell shrugs put primary focus on the upper (trapezius) and middle portions (rhomboids) of the upper back. The middle portions are worked when the shoulder blades are squeezed together and to the back. It will eventually become impossible to rotate the shoulders. The threshold will be different from person to person, but when the weight becomes too heavy for the individual rotation will no longer be possible. When done with heavy weights in particular, maintaining one's grip can become quite difficult. There are couple viable options that can be explored when faced with this problem. There are specially designed grip strengtheners that can work wonders, provided the necessary time and effort is put in. Captains of Crush grippers, made by a company called Iron Mind, make premium grippers which are specially crafted for people who are serious about strengthening their grip. There are several grippers available, each with different pound difficulties depending on one's goals and grip strength.